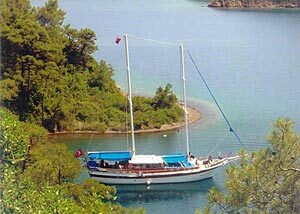 The M/S GÜLDEN IRMAK is a superb motor sailor designed for full charter comfort at an excellent price. She has six cabins containing a double and one smaller cabin with another double bed. All cabins have ensuite bathrooms with home style toilets. The cabins have air conditioning which can be run for several hours daily during naps or when preparing to sleep for the night. So all together, comfortable for 12 guests or when with kids, up to 14. 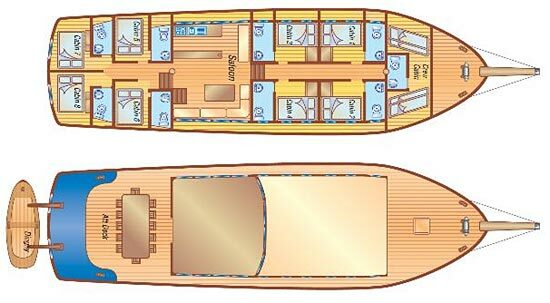 Comfort/Recreation: Spacious sun deck area with Sun mattresses and cushions, Sun awning, Cushioned aft deck with a large table, Deck chairs, spacious saloon with bar and dining table, Music Set, Color TV, Fiber Dinghy with outboardengine, Snorkel and Fishing Equipment, 2 Canoes, 1 Windsurfer. The crew of three have their separate quarters. On M/S GÜLDEN IRMAK you will be served Turkish cuisine at its best. You may choose between Fullboard (3 meals + teatime) at a price of only € 28,- p/person per day . If there are vegetarians among you, no problem at all, the Turkish cuisine is the best solution for that, you just tell us. Soft Drinks and alcoholic drinks are extra, we offer you to buy them in a supermarket and you just pay us the bill plus a service-extra of only 10% (that's for the crew): We think that's a fair offer and all our previous guests did appreciate that. The M/S GÜLDEN IRMAK meets international safety regulations including life jackets, fire extinguishers and alarms.